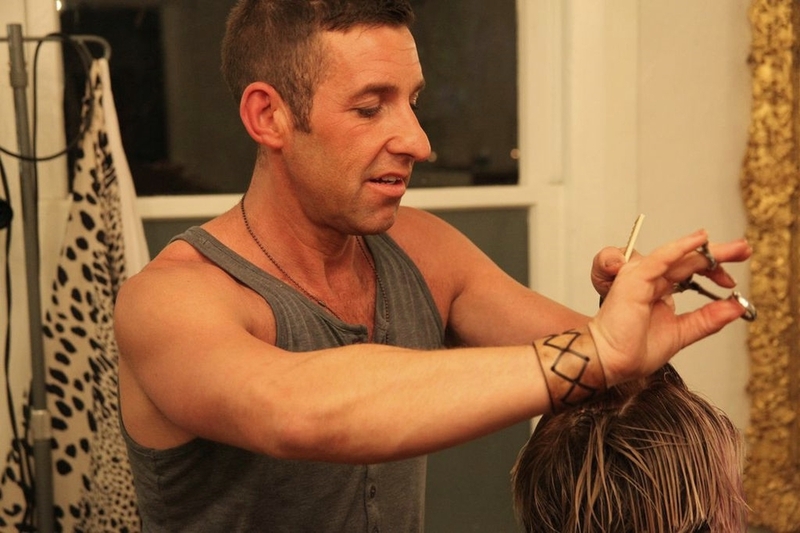 Derek Smart is a celebrity hairstylist who has been trailblazing the international professional hair world for years. As a seasoned veteran, with more than 25 years experience and a client list to back up his incredible craft, Derek is finding new ways to express his creativity. With his newest professional venture of being a salon owner, he continues on his determined quest of connecting each individual to his or her innate beauty through the medium of hair. Signed on as a monthly beauty contributor for Established California, Derek invites us into his remodeled California Bungalow Salon for a closer look of who he is and what keeps him inspired after all these years. We are positive you will fall in love with his witty and bright personality, just like we have! Keep a look out for this celebrity stylist’s upcoming tips on all things hair. When did you know you wanted to be a hair stylist? My older sister suffered from Alopecia, a condition that caused her to have no hair for most of her childhood. As mom would buy wigs and hairpieces for her, I always felt like they looked too thick and unnatural. I would constantly find myself trying to style and razor cut the hairpieces so they would look more natural for her to wear. Needless to say I knew from a young age I wanted to be a hairstylist. However, it was not just because I enjoyed helping my sister feel more comfortable with wearing wigs. Seeing first hand, how people’s attachments to their hair have direct connections to their emotions and sense of identity was something I wanted to be a part of in helping. My love for people and fascination with beauty, music and fashion continue to be driving force to my creativity. I find inspiration everywhere from the avant-garde runways to my individual clients sense of style. It is in my spin on the styling, which keeps these looks seamlessly wearable for all people and always make it the perfect accessory. What was you first big opportunity? I began my professional training under Stephan Wake. It was under my apprenticeship with him that I was able to stand on stage at the World Hairdressing Congress in London in front of 5,000 people and be recognized for notable work in hair. In my relocation from England to California, I spent the next years working high-end places like The Bungalow on Melrose Place and Sally Hershberger as I developed my entertainment and fashion driven clientele. How would you describe your signature look and what is it about your style that sets you apart from other hairstylists? At this stage, I feel like I am in my masters program for hair. Now with my own salon, which gives me time, space, and peace the creative work that transpires from me has moved into more fine art. The last couple of years I have honed in on my ‘Smart Method’ of color and cutting techniques that use new ways of sectioning the hair. A sectioning design that uses diamond shape patterns, I am achieving precision and on-point techniques that consider movement between light and shadow. As a result maximum contrasts are achieved to the depth of field. I find my clients hair to be much more dimensional and dynamic. What is your favorite California hair trend? I am obsessing over the messy beach braids seen on the likes of Blake Lively and others during award shows. I find myself continuing to do California effortless styles that create knots by tying the hair back with itself. What is the number one hair tip you would give women on the street? I wish more people did not fight the natural texture of their hair. The "Smart" choice is to go with your hair’s flow and natural tendencies. The path of least residence is always best. So, love it and rock it! What do you do when you are not doing hair? I love heading out to Runyon Canyon or Griffith Park and hiking with my old Sheep Dog, Shirley. I also love to cook! My favorite is blending the country-style cooking I grew up with England and the healthy California cuisine I love, in all my dishes. What do you love most about living in California? Honestly, it is the abundance of opportunity. California can offer a stress-free lifestyle if you choose it. I am addicted to the ‘immortal’ sense California exudes through its lack of extreme seasons and overall forever young mentality. What is your favorite dinner location in Los Angeles? Loving the The Church Key, LA currently. Everyday I crave bacon and cheese sourdough rolls. They are my guiltiest of pleasures. Eleni Hopkins grew up in a home where art and fashion were always the forefront of conversation. A Native to San Francisco, her passion for style, color and texture have made her fearless to take risks in order to stay on the cutting edge of fashion and beauty trends. It was her craft with palettes of color and make-up brushes that prompted her move to Los Angeles and her love for clothing, designers and street trends that have kept her here. With a creative but critical eye, Eleni is excited to share her love for dress up and show readers how to spice up their wardrobe and enjoy their time in front of the mirror. HOW TO TIE A HEAD SCARF: 3 WAYS!